If you are thinking of a holiday this year or next, and you want to go somewhere a little different.The Indonesian city of Jakarta is a great place to look. This is not yet a huge tourist trap, so you don’t have to worry about high prices and overly busy waiting times. Yet there is so much cultural and historical splendour there .That you would be forgiven for never wanting to leave. As we will see, there are a number of surprises which lay in wait for anyone consider visiting this Indonesian capital.So it might be a great place to consider for your next trip.No matter how much you might have considered it in the past or not. Let’s take a look and see what you might discover of Jakarta’s secrets. Because of its position in the world geographically.You might be forgiven for assuming certain things about Jakarta culturally. The truth however is that if you know where to stay and how to find the right places.You can actually stay in Jakarta in absolutely luxury – and without having to overspend your money either. Staying somewhere like the JW Marriott hotel Jakarta will ensure that you experience all the luxury you would ever want from a holiday, and you will almost certainly find that it is easy enough to get around in luxury as well. Private taxis and even limousines are relatively cheap to hire.You will soon find yourself wandering around the city feeling like complete royalty. Do you like to shop when you are on holiday? A lot of people do.It just might be that Jakarta might surprise you with how many shopping opportunities it has. No matter what it is that you are hoping to treat yourself to.You will find that you can get it in Jakarta, with one of the highest numbers of shopping malls and centres of any city in the world. You can also go to the many markets for a little more of the traditional Asian feel. If you prefer to buy your goods that way. But either way, you are bound to be blown away by just how much shopping you can get done on your trip to Indonesia this way. A lot of people travel for spiritual reasons of their own, and sometimes visiting a highly spiritual place is the best way to do that. There is absolutely no doubt that Jakarta is the kind of city where you can expect to see some amazing spiritual sights.Whether it is the simple beauty of a temple or worship place or just the acts of religiosity in the people you will meet and come across. 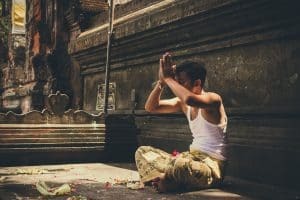 A highly spiritual city, you can be sure of having your soul nourished a surprising amount in this vibrant place – and yet it is not one of the first things you would necessarily think about when you were considering visiting Jakarta. Have you ever thought about visiting Jakarta?